Commerce Secretary Suffered 'Seizure' At Time Of Crashes, Dept. Says : The Two-Way Much is still unclear about what happened in California and whether formal charges will be brought against Commerce Secretary John Bryson. 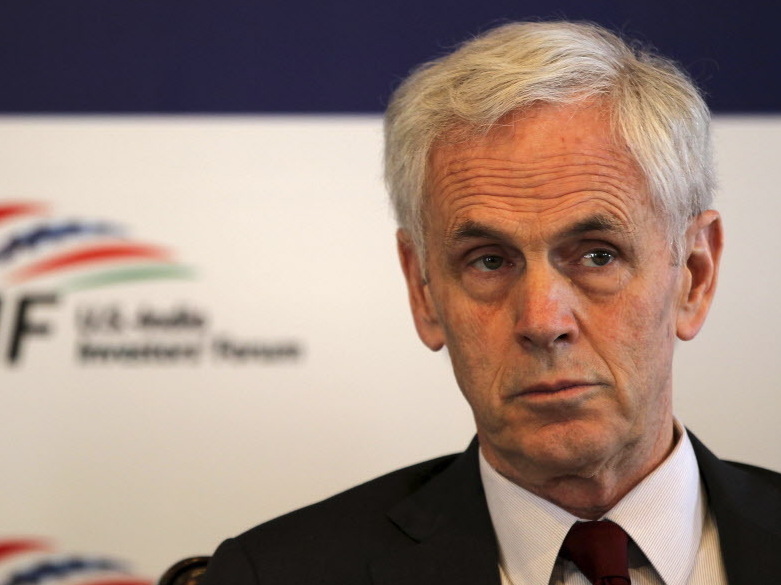 Commerce Secretary John Bryson in March, during a visit to Mumbai, India. Commerce Secretary John Bryson suffered an apparent "seizure" before a series of car crashes on Saturday in Los Angeles, a department spokesman says, according to an Associated Press "alert" issued just after 9:30 a.m. ET today. As we reported earlier, Bryson was involved in three seemingly fender benders that did little damage and left those involved with only minor injuries — but led police to cite him for "felony hit-and-run." The Commerce Department announced late Monday that the secretary is to take a medical leave of absence effective immediately. His deputy, Rebecca Black, will take on the role in his absence. "I notified President Obama this evening that effective immediately I am taking a medical leave of absence so that I can focus all of my attention on resolving the health issues that arose over the weekend," Bryson said in a statement. The Los Angeles Times writes that the secretary "voluntarily took a Breathalyzer test after being involved in two hit-and-run accident Saturday, and the test detected no alcohol use, Los Angeles County Sheriff's Department officials said." Bryson is now back in Washington, D.C., Commerce says. At the White House, spokesman Jay Carney said today that officials there were told of the incident Sunday evening and President Obama was informed this morning. Update at 10:45 a.m. ET. On-The-Record Statement From Commerce. "Secretary Bryson was involved in a traffic accident in Los Angeles over the weekend. He suffered a seizure. He was taken to the hospital for examination and remained overnight for observation. He was released and has returned to Washington. The investigation is ongoing. Secretary Bryson has no public events scheduled for today." That's the official word from Jennifer Friedman, Commerce Department spokeswoman, in an e-mail forwarded to us by NPR's Scott Horsley. Commerce Secretary John Bryson has been "cited for felony hit-and-run" after he was involved in a series of traffic accidents in California's San Gabriel Valley, the Los Angeles Times writes. "Bryson was allegedly travelling southbound in a Lexus on San Gabriel Boulevard and rear-ended a Buick occupied by three males that was stopped on the street awaiting a passing train. Bryson spoke with the males, then left the scene, hitting the same car again as he left the scene. The three males followed him in their car while calling San Gabriel Police officers via 911 and asking for assistance. "Bryson drove into the neighboring city of Rosemead. Rosemead is policed by the Temple Sheriff's Station of the Los Angeles County Sheriff's Department. "The investigation is in its preliminary stages. At this point in time, there is no indication that alcohol or drugs played a role in the collisions. All parties were cooperative with law enforcement." The Times says that "Bryson was treated at the scene by Los Angeles County firefighters. ... He was cited for felony hit and run but was not booked into jail because he had been admitted to the hospital. His condition was not known." Police say two of the three men in the Buick "were treated by paramedics for complaint of pain" [sic]. A woman in the second vehicle "complained of pain" but declined medical aid. "There was minor damage to the Lexus and Honda Accord," police say. As Bryson's official biography states, before joining the Obama administration he "served as Chairman and Chief Executive Officer of Edison International, the parent company of Southern California Edison and Edison Mission Group, from 1990 to 2008." He is also a past president "of the California Public Utilities Commission and chairman of the California State Water Resources Control Board." According to The Associated Press, Bryson is 68. It adds that "as secretary, Bryson has played a role as a member of the president's economic team and has worked to promote job creation. He has also advised on energy issues, particularly in the clean energy sector." Update at 9:15 a.m. ET. Bryson Is Out Of The Hospital, Commerce Says. "Secretary Bryson was involved in a traffic accident over the weekend. He was taken to the hospital for examination and has been released. He has sustained no injuries and the investigation is ongoing."